. Published on January 22, 2019. Why choose MightyCall over other providers. Once you’ve decided to subscribe to a virtual phone system, it’s important to assess the market. The problem is however, that the market is filled with service providers of varying quality, functionality, and pricing. In such a competitive environment, making a good choice requires doing plenty of research—pouring hours into commercial websites and comparisons. In this article we’ll give basic guidelines for choosing a call-processing system. We’ll also compare MightyCall with its major competitor, Grasshopper. Hopefully this will save you a bit of time and effort. Your business and its demands are unique. Before subscribing to a virtual business number service, write down the essential information about your operation and make a list of functions you consider indispensable. Depending on the size and sphere of your business, you will get different volumes of incoming calls to your virtual phone number. Service providers generally offer multiple rating plans with included minutes/messages and a package of features. Try finding the package best for you, but there should be a painless way to switch plans if your needs change. 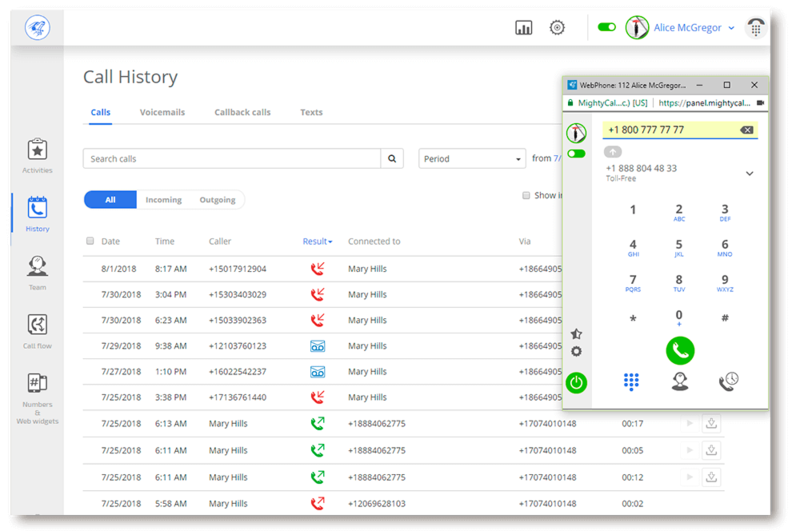 Multiple extensions allow you to forward calls by means of a short “tail” off the main business number. This is the most convenient way for your clients or employees to keep in touch with different divisions of your company and makes communication efficient and flexible. If you are not a solo entrepreneur, consider providers which don’t charge for additional extensions. The amount of red tape. The reason VoIP has been so successful has largely been because it’s cloud software that is super convenient to get started with. With that in mind, consider how easy it is to get started with any company: Do they offer trial periods or money-back guaranteed windows so you can test out the system for free? Do you need hardware—even worse, hardware you’re required to rent—to start using the system? Are there any activation or cancellation fees? Do you need to sign a long-term contract that’ll be hard to break? A virtual phone provider should make things easy for you, so don’t settle for their red tape—you don’t have to! Again, this is more about having choice. “Softphones” are phones you can use via a web browser or on your computer. This is a great work-around for people who spend a lot of time in their office but don’t want to rent and install costly hardware. A typical virtual call-processing system is quick and easy to deploy because it doesn’t require any dedicated equipment. Using and configuring the system is another story, though. Opt for providers who offer clear instructions on the matters you find important. It’s even better if their website offers video instructions and a customer support team is ready to help. Also, don’t take a provider’s easy-to-use claims at face value ― many offer trials or demo versions. Don’t hesitate to give them a try. Nothing is perfect, so eventually problems occur even with the most stable systems. Make sure your provider has a professional support team and they are accessible and ready to assist you. Frankly, this is why a large telecommunication company is not the best choice for small business owners. For them the value of each individual customer is much less compared to smaller providers who can deal with your problem individually. Some private branch exchange providers are limited to using PSTN (Public Switched Telephone Network) ― conventional landlines which offer exceptional reliability and don’t depend on internet connectivity. Other virtual phone systems utilize the VoIP protocol, which supports real-time voice conversations over the Internet. Naturally, the stability and sound quality of such services is dictated by your bandwidth, but VoIP is cheaper and offers more functionality. Sophisticated virtual phone number providers support both protocols, which spares you the trouble of choosing and grants versatility. If your staff is constantly on the move, ensure you can reach them on their phones. Check for features like mobile applications and call routing to mobile phones. Additional mobile functionality like to-do lists, immediate task assignment, and social media integration are also immensely useful. Grasshopper, the largest company in the virtual telephony market, is viewed as MightyCall’s main competitor. Both companies have been working for years providing virtual phone numbers and associated call-processing to small and medium business owners. The entry-level pricing also seems comparable, but there are some substantial differences as you scale up your system. For those getting their business started or keeping a small operation, the entry-level costs lean in MightyCall’s favor – $24.99 compared to Grasshopper’s $29. MightyCall’s value here is superior as well, offering 2 local or toll-free numbers to Grasshopper’s 1, and transferring your existing number for free—something Grasshopper charges $30 for. If you want text messages included in your plan, you’d need to pay Grasshopper an additional $10; MightyCall provides you with Unlimited text messages for free. The mid-level plans—the most popular—clock in at $49.99 for MightyCall and $49 for Grasshopper. But again, Grasshopper charges you for additional services MightyCall provides with the package, such as text messaging and voicemail to text. What’s worse, Grasshopper’s international capacity is limited—they don’t provide international numbers and make you pay a Draconian $500 deposit if you need international calling. MightyCall offers international numbers at just $10 on a pay-as-you-go plan for international calls. For the most extensive plans, MightyCall’s Ultimate costs $99.99 compared to the $89 cost of Grasshopper’s Small Business plan. MightyCall’s Ultimate plan even has features Grasshopper lacks — availability status, the webphone, softphone & hardphone support, social media tracking, and integrated API. Grasshopper’s Small Business plan is the only one they have offering unlimited extensions—something every MightyCall plan offers. The main difference in all of these plans is the number of minutes provided. Grasshopper’s plans all offer unlimited call minutes, while MightyCall offers unlimited calling only on Standard and Ultimate plans. No matter what package you choose, MightyCall offers a broader range of functions including the flexibility to configure how your team receives calls. At no additional fee MightyCall includes 4 call distribution options (simultaneously ringing all the phones, going in a circle, a predefined sequence, or to the freest team member). Grasshopper only has the sequential method. The simultaneous method is available for an extra $10 a month. MightyCall offers unlimited free extensions on every plan. MightyCall offers enhanced website integration with an exclusive Contact Us page and the original Click-to-Call widget. The Contact Us widget serves as an attractive on-site business card. In an easy-to-read format, it includes vital contact information such as your business number, address, email, social network info and so on. You can also mark your business’s location on the map to get automatic directions. The widgets are optimized for use on mobile devices and work seamlessly wherever you go. The Click-to-Call widget enables visitors to easily call your office via VoIP or send a call-back request or email straight from the site. Calls from the widgets can be routed to any location, while messages appear on our exclusive Multichannel Activity Dashboard along with missed calls, voicemails, emails, and mentions or direct messages from Facebook and Twitter. Accessible either from a web interface or a mobile app, the Activity Dashboard allows you to sort out communications according to their urgency level. Then you can assign them to your workers/colleagues and issue to-do lists. Detailed statistics are also included for analysis. To ease communication within your team, MightyCall also offers internal calling and a cutting-edge webphone. These features make for the smoothest communication within your team, allowing you to receive calls, forward calls, and make conference calls all from your website or smartphone. Social media is also critical nowadays, so MightyCall keeps you plugged into the scene with Social Media Tracking to let you use Twitter and Facebook to your advantage. Even more importantly, Grasshopper lacks IP telephony. Sure, the conventional telephone lines Grasshopper uses are independent of bandwidth, but for some setups softphones are preferable (since they don’t require telecom equipment), so robbing clients of flexibility isn’t great. No worries, MightyCall has VoIP. And last, but not least: MightyCall’s automatic call distribution system is designed with a business setup in mind; Grasshopper’s is oversimplified. There, subscribers can only set hours to route callers to personal extensions. Our system is different: by means of an intuitive flow-chart, it is possible to configure a routing tree which will behave differently depending on the time, the day of the week, and the availability of team members. It’s undeniable that MightyCall’s system functionality and capability are more expansive than Grasshopper’s (and at a cheaper price too). Some might not notice a big difference, but for the majority of clients these features are essential.